Then, pan-fried it and served it alongside white rice flavored with turmeric, saffron, and chicken broth, and some quick-sauteed bok choy. Normally I’d season the bok choy with soy sauce, but no soy for me on the Feel Good Cleanse, so instead I used my trusty coconut aminos. Sometimes it’s those nights where I’m cooking by myself, thinking I’m going to just whip up something quick and easy, when nobody else is around to witness it, that I wind up eating masterpieces for dinner. I guess that’s how this blog originally started, but now that I live with Jesse those nights feel more rare. Not that he won’t eat anything that’s put in front of him, and probably seconds and thirds as well, but when we’re cooking together, or even just when I’m cooking for both of us, I find myself sticking to the tried and true, even using recipes more. So Monday night, while Jesse was out bowling with the boys, I found myself out running errands until just before dinner, and en route home totally ravenous. I so rarely do this — stop at the grocery for like a single item — but I was craving some sort of fish. 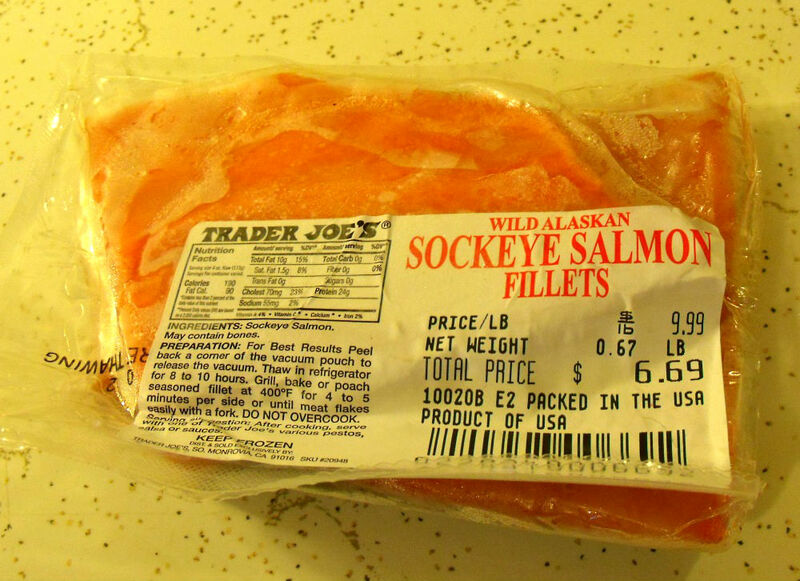 The Johnson Creek Freddy’s actually has a pretty decent seafood department, so I pulled over totally impulsively and bought a piece of salmon. This was no big splurge — it was less than $7 for the whole piece, which I only used half of and froze the rest (and wound up with leftovers for lunch, still! 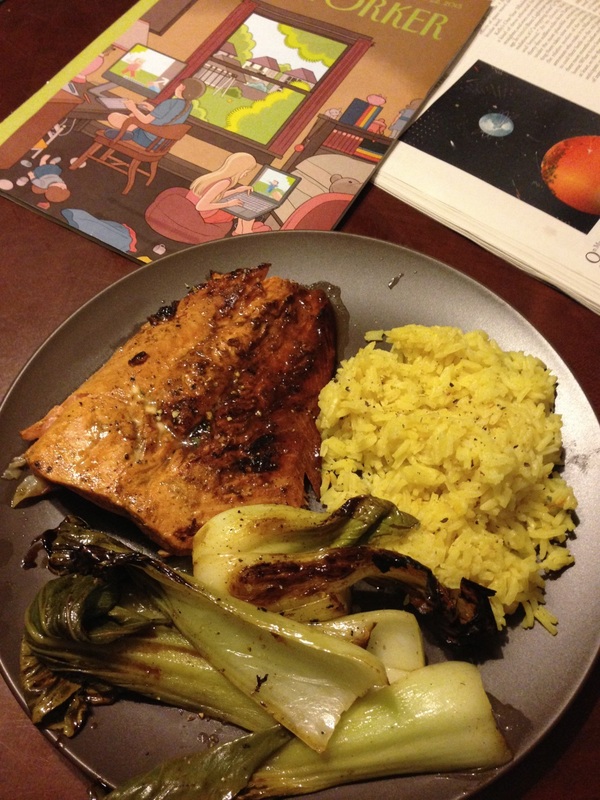 ), but it still felt nice to treat myself to exactly what I wanted, and make a delicious meal, just for myself. Like I always used to do! 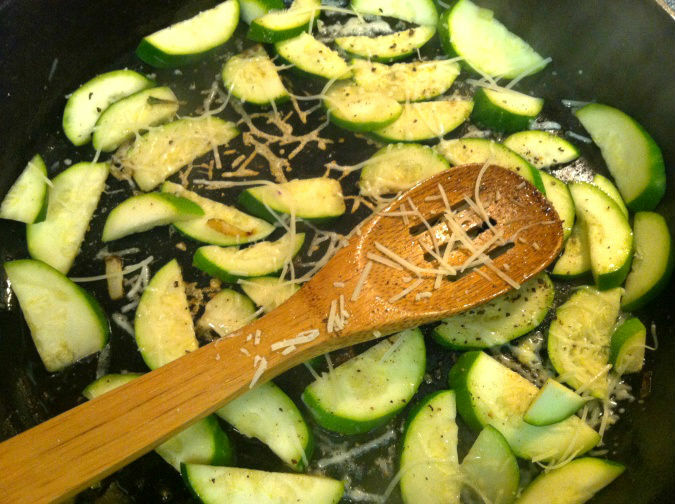 This was partially inspired by a super simple Ina Garten recipe (I’m currently reading through the Barefoot Contessa Family Style cookbook), urging me to cook my zucchini slices in small batches so they brown and crisp instead of steam and get mushy, and then cover them in parmesan, for good measure. She’s right, I realized, this is the reason I always forego the zucchini, because it always gets mushy and overcooked, no matter what I do. And the pasta? Angelhair pasta was undoubtedly the carb-y texture that I was craving that night, and we just happened to have a partial package of it in the pantry. Bingo. 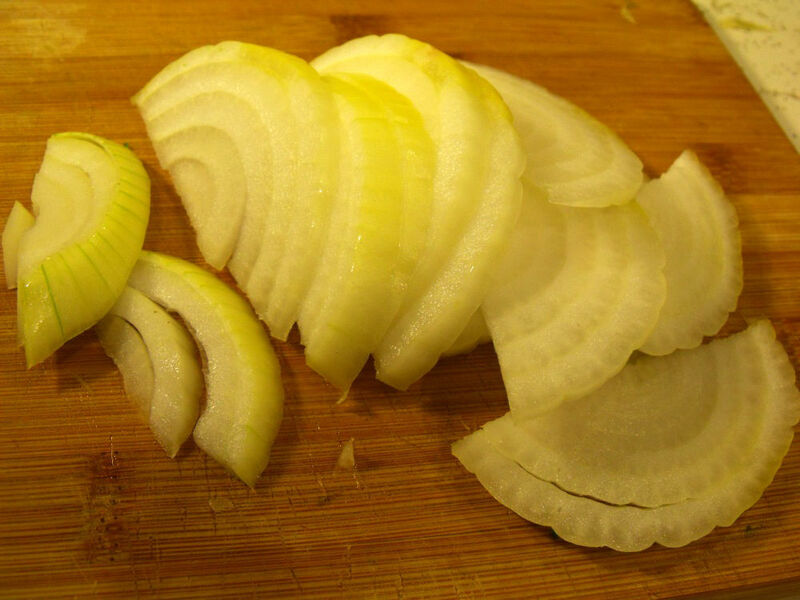 First I sauteed up half an onion in some super delicious olive oil. I’d made some homemade feta a few weeks back, which you can store at room temperature, as long as it’s submerged in oil. I had added some rosemary in there for good luck, and now that all the cheese is gone, I’m left with this wonderfully dank olive oil to cook with! Like I said, I cut the salmon steak in half, and stuck the rest in the freezer. This part, I stuck straight into the skillet, (which I had now cleared of the zucchini, keeping them warm in a covered bowl), skin side down. After about five minutes I flipped it, and now the skin peels easily off, as if it were never even attached. I covered it again and let it blacken with all the residual salt, pepper, and cheese flakes that were in there from the zucchini, and then added a sliced red pepper in there along with it. I make popcorn, like, almost every night. Pretty much, yeah. 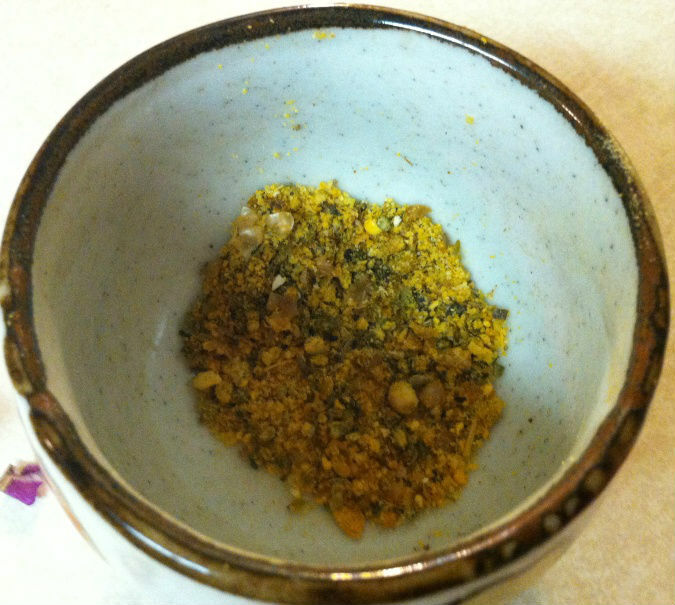 Someday I’ll show you how the pros do it, but for now all you need to know is that I make a little mixture to sprinkle on, that involves nutritional yeast (fine grain), Lawry’s salt, pepper, and oregano. After each batch of popcorn, there is a thick layer of detritus at the bottom of the bowl from where these seasonings missed the kernels and sifted through. I save this in a little bowl and sprinkle it on just about everything, because it is unbeatably delicious. So if you ever hear me referring to just general “herbs,” this is probably what I’m talking about. Watch out for the kernels. Meanwhile, I’m boiling some water and cooking some angel hair pasta — just enough for a single serving. Jesse and I had big plans to cook risotto on Tuesday night, so I’m not looking for leftovers here. Once the pasta was done I strained it, threw it right back into the pot, and added some butter, a few shakes of nutritional yeast, a splash of cream, a few squirts of lemon juice, and some cracked pepper. 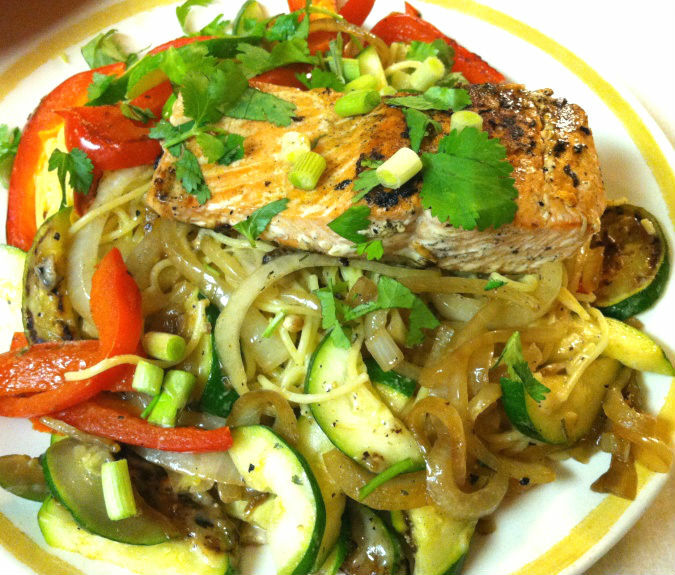 I mixed that all up and poured it onto a big plate, serving as the “bed,” and then on top of this added the zucchini, peppers, and salmon. They had all been waiting for this moment. 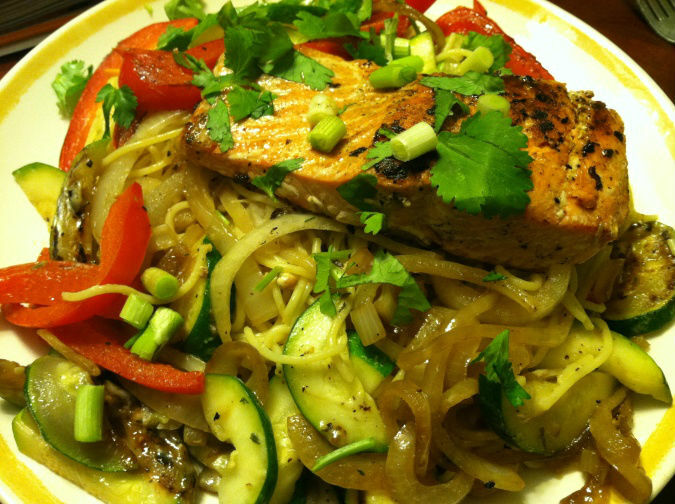 Don’t tell Jesse, but sometimes salmon tastes best when you’re eating alone. I came home on Monday from 5 days out in the woods, living out of a cooler (though a very methodically-stocked gourmet cooler, if I do say so myself), and the only errand I could come up with that seemed appealing on my 89-degree day off was a trip to Fubonn. Oh man, do I love Fubonn. Even though at this point I like to think I have a handle on it — which items I’m looking for, their approximate location in the store, I prove myself wrong every time, and even if I think I’m just going to pick up a gigantic $3 bottle of sesame oil, I end up wandering the aisles in a daze for at least 2 hours, comparing brands of coconut milk ounce-for-ounce, wondering whether it’s worth it to get the bamboo shoots in the glass jar rather than the can, and marveling over how the Indian curry paste is clear across the warehouse-size store from the Thai curry paste! And then, just when you think you’ve wrapped your head around it all…here comes a whole new aisle of soy sauce. It looks just like the first aisle from 75 minutes ago, but here it is again! Why?! I always begin with a Vietnamese iced coffee from the deli counter-esque area right at the entrance which is served over the most finely crushed ice you can imagine, and with a vacuum-sealed plastic cover. How do they do that? I ponder this while I snake up and down the aisles with a gigantic shopping cart and just let it take me where it will. This usually lands me in the checkout line with the most random assortment of foods you can imagine, and an absurdly low total bill. I regret not having taken a picture of my loot, because truly, it carpeted the entire register area and somehow came to only $50-something. And it is also how Tilapia Yakisoba became a thing. I didn’t think I wanted to actually end up cooking anything Tuesday night, on what had been a swelteringly hot day. But you never know…after the sun goes down in Portland, the temperature really plummets — enough where I was even able to go for an evening run, shower, change into pajamas and decide I was done sweating for the night. And then cook a meal on the stovetop. This was definitely a “get rid of all the veggies that are about to go bad” kind of meal, especially the ones we’d chopped up for the weekend and brought in the cooler but had never used in the chicken masala Sunday night. 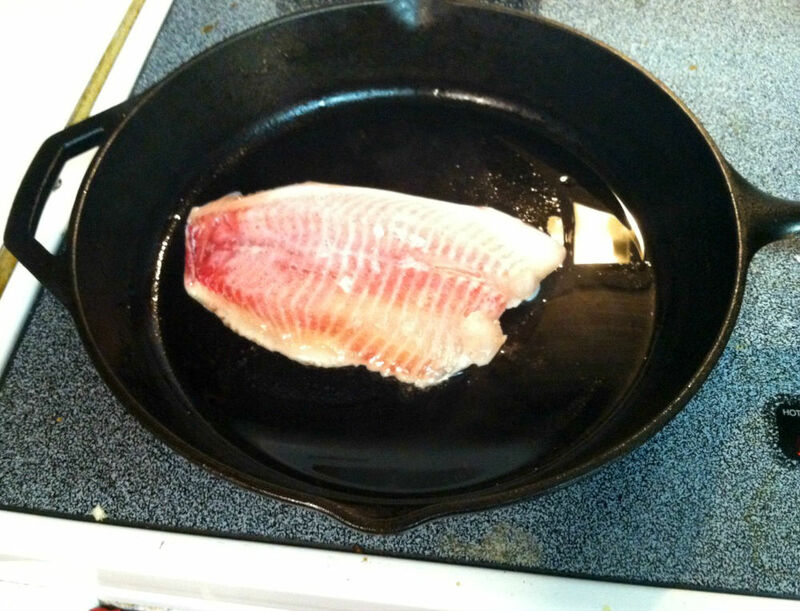 And, I was curious what dirt-cheap tilapia from an undisclosed location tasted like. It was already frozen, and not going to be the main star of the show, so I fried it up in the skillet, letting it defrost as it cooked. 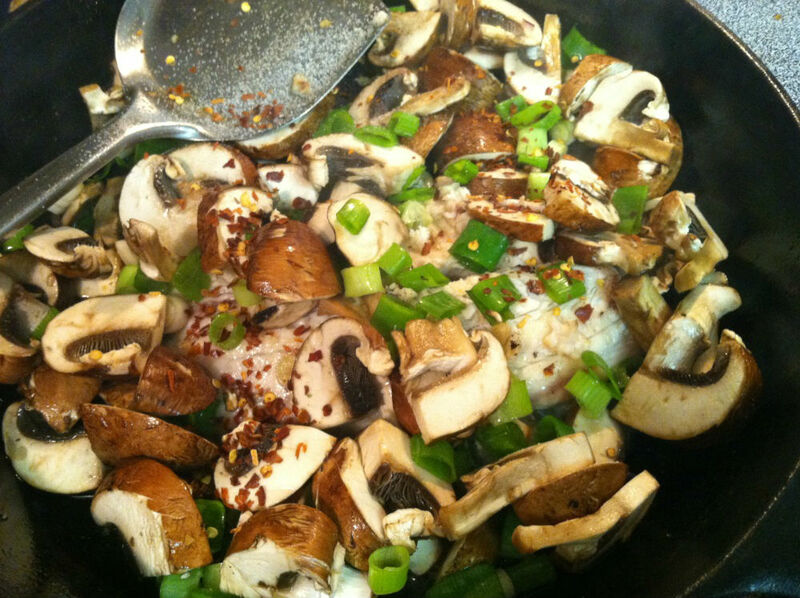 These mushrooms and green onions had already been sliced and stored — ready to go, there was no clearer option than to toss them in with a little salt and chili flakes and let them sautee up with the fish. I also sliced up a red bell pepper and added this into the mix. 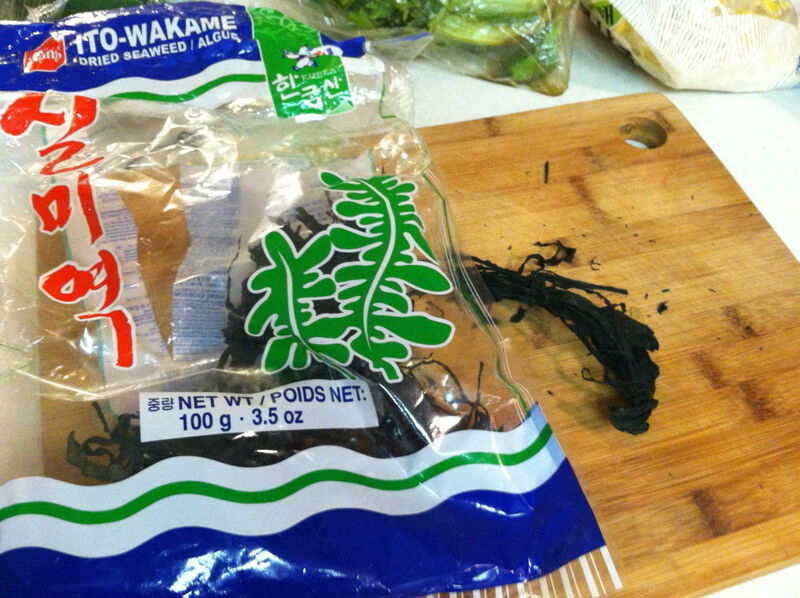 Then, of course, my favorite green to throw in the mix when I don’t have anything fresh is some wakame seaweed, perfectly salty and chewy once it gets a little dose of whatever juices it’s cooking in. 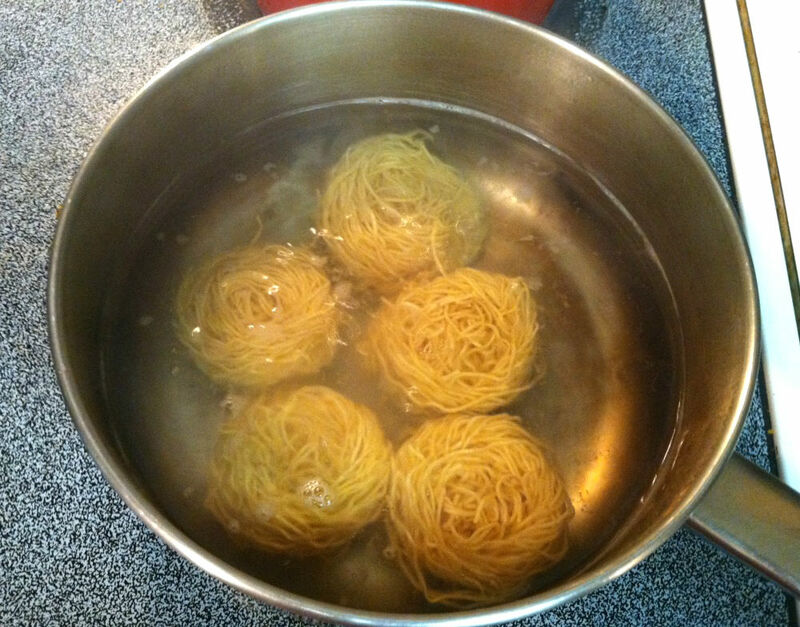 Maybe this is a misnomer, because I didn’t actually use soba noodles for this, but rather those wonderfully light Asian noodles that come curled up in these little balls and loosen up into wavy kinks like ramen once you cook them for just a minute or two. I didn’t even use a colander to strain these, since I wanted a little extra water to loosen it all up, so I just drained them using the lid and then added them to the skillet with everything else. I already had some sauce on hand that I’d made a few nights ago when I had made a delicious garlicky Asian green bean salad, comprised of soy sauce, rice vinegar, sesame oil, ginger, honey, and garlic, which I added to this skillet-of-everything, and then augmented by adding a little more of the soy, vinegar, and oil. 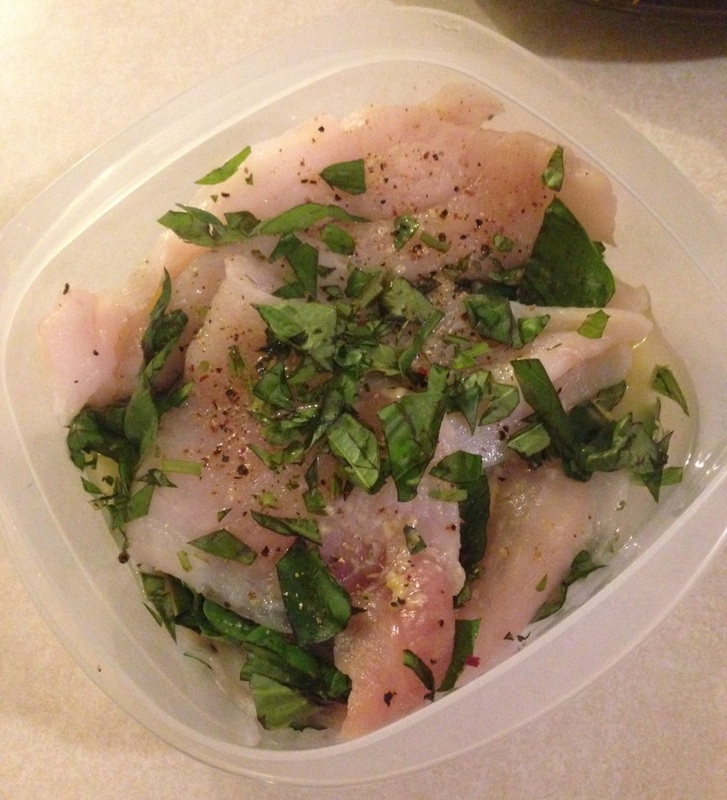 By this point, the fish had broken up and distributed throughout the dish, so a few quick little stirs was all I needed to mix the sauce in, let it rest for five minutes, and then dish it up with a handful of bean sprouts on top to give it a refreshing crunch. It was, after all, still 80 degrees outside by the time I took this out to my (new!) back porch to enjoy in my camping chair. Someday soon I’ll have to get an actual table to eat at. Red pepper spread: $2.49 — my favorite condiment in the world!! Basil in a pot: $2.99 — I don’t live in a basement anymore so now I can plant this in my kitchen!! REMAINING FOR THE MONTH: -$8.59 — Okay, a little bit over for this month, but just you wait. 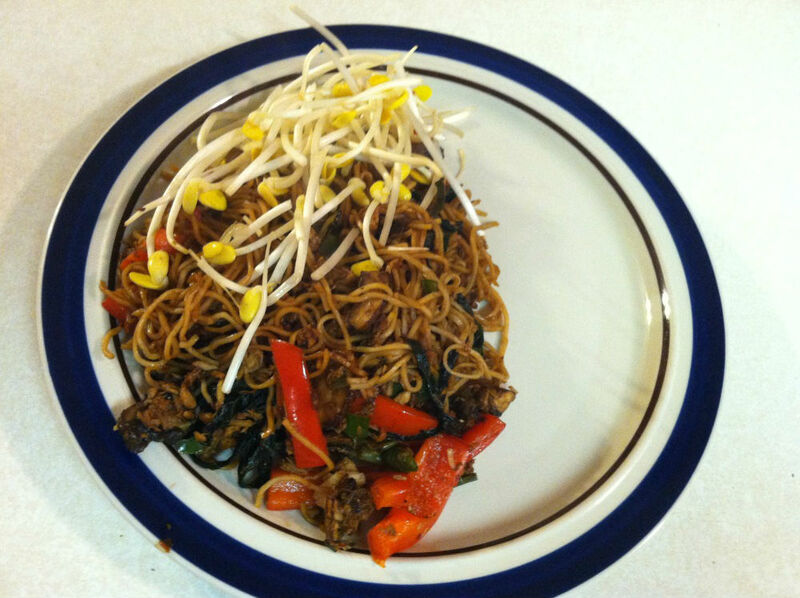 I’m going to be making yakisoba till the end of time. 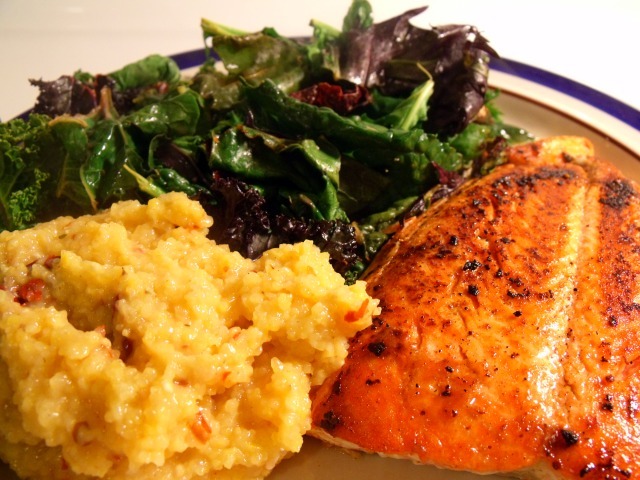 I love when I can make a delicious dinner entirely out of what’s already in my kitchen, and all that is required is stopping on my bike ride home to pick up some fish and a head of collard greens. I can’t even believe how busy this week is, and relish in the fact that with all that’s going on, I still take the time to cook myself a delicious meal on a Wednesday night. Really, at a time like this, I should be eating take-out or leftover pizza from UCU last weekend. I mean, seriously. After driving back down to Portland on Sunday night, I spent all day Monday unpacking from the show and reorganizing the shop, prepping for the coming work week, especially because my wonderful employee is on vacation and I’m flying solo for the next 2 weeks. Awesome timing. Then on Tuesday morning, I signed about 1,000 pieces of paper, and agreed to a bill whose final payment is due in 2042. Yep, I bought a house. NBD. Then, I’m working all week, getting the keys to the house, spending the evening with my best friend who just got back from 3 weeks in Hawaii, hosting old high school friends from out of town Saturday night, and then quickly washing the sheets so I can host my business partner for a 24 hour debrief of last weekend’s show. And we’ll treat ourselves to a fancy dinner in there somewhere. Oh, and then Monday I had to buy a fridge. And a bed. And then Tuesday I move. Into my new house. And then Wednesday I will go to work and spend the whole rest of the evening prepping 4 days worth of food to bring with us to String Cheese at Horning’s, the festival we’ll be at the whole following weekend. And yet, last night I came home and still felt compelled to cook this. As soon as I walked in the door and poured myself some iced tea, I got a pot of red and brown rice started on the stove. 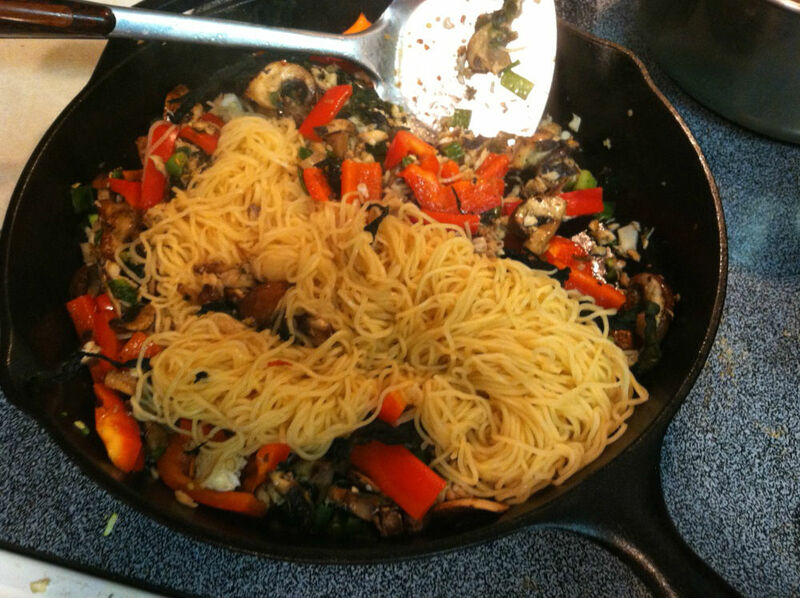 A lot of times when I make a teriyaki-esque type of sauce, it involves stir frying veggies or noodles or meat first, then incorporating an Asian sauce concoction into it. But for some reason this time, I just wanted a nice thick, bubbly sauce, so I started with that. 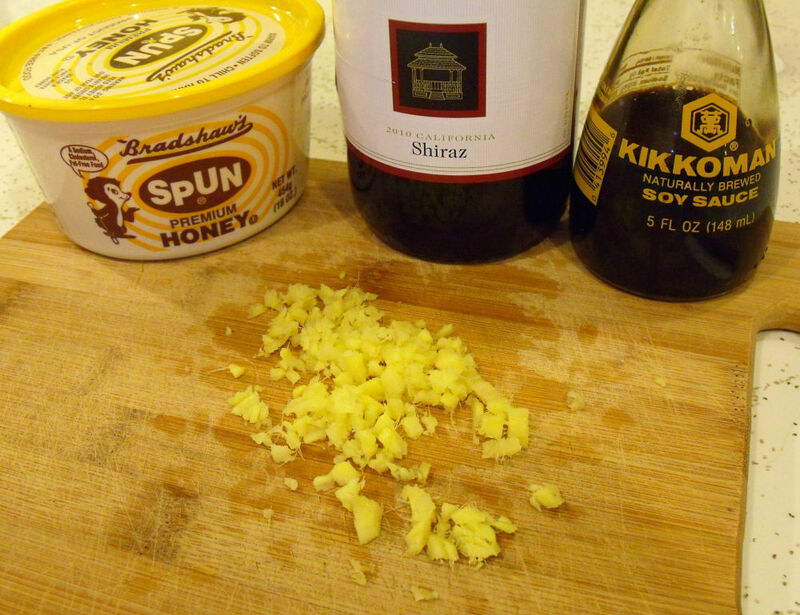 Pus, I have about 9 half-used bottles of red wine that I’d really love to not transport with me to my next residence, so this seemed like a good way to tap into that. This went into the big skillet on medium-high heat with some honey, soy sauce, chopped garlic, and a hefty amount of red wine. 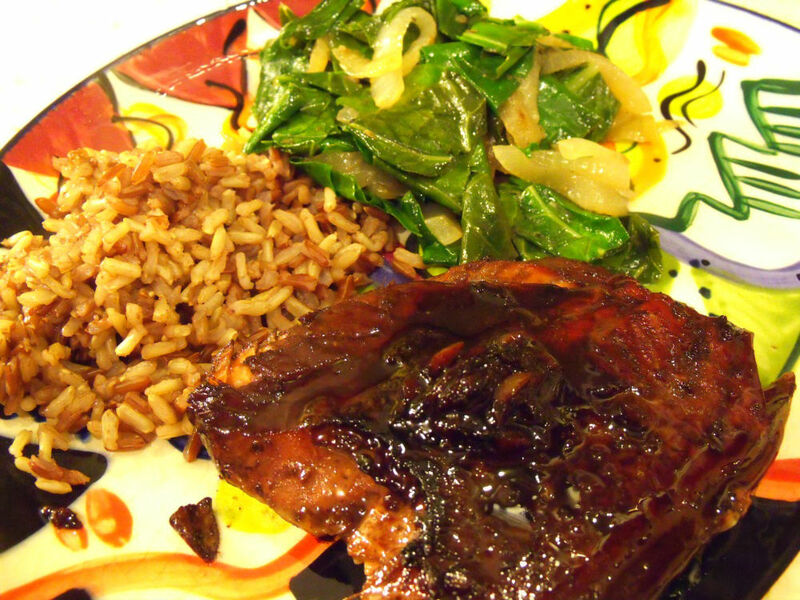 It smelled disgusting at first, but once the sauce bubbled together and reduced and the alcohol cooked off, it became deliciously sweet and dark and syrupy. 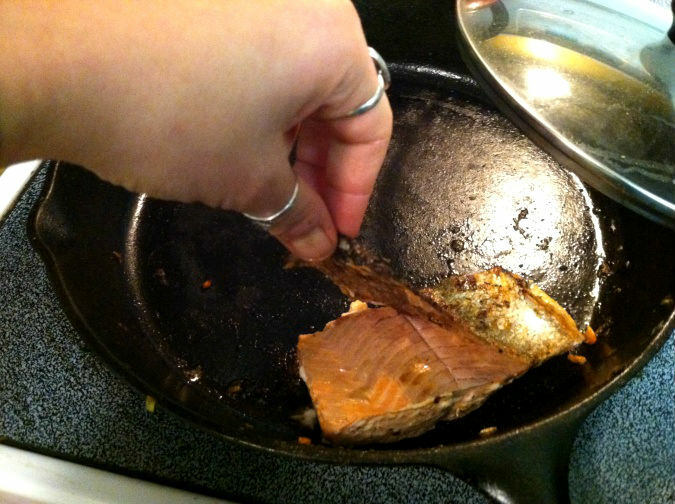 I put the salmon directly into the skillet, still frozen, and let it thaw and start to cook from the steam as the sauce continued to reduce and the water evaporated off the fish. 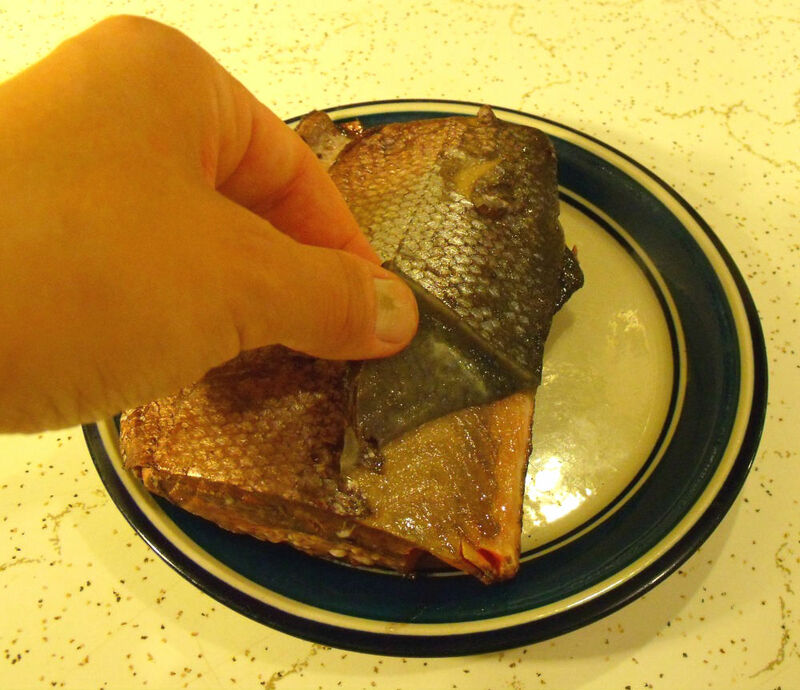 When it was about half cooked, I was able to remove the fish and peel off the skin with my fingers, removed the sauce from the heat and let it all sit there while I worked on the greens. 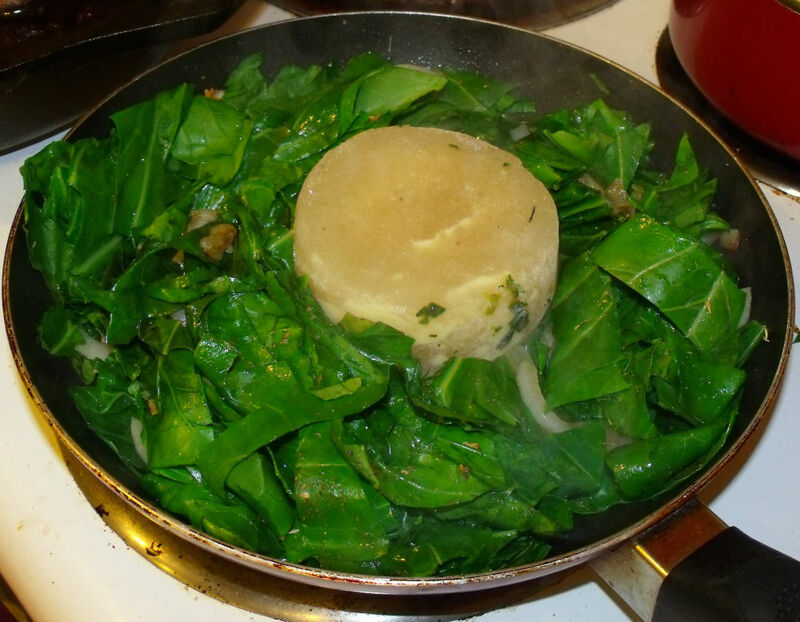 Have you ever had to deal with collard greens before? 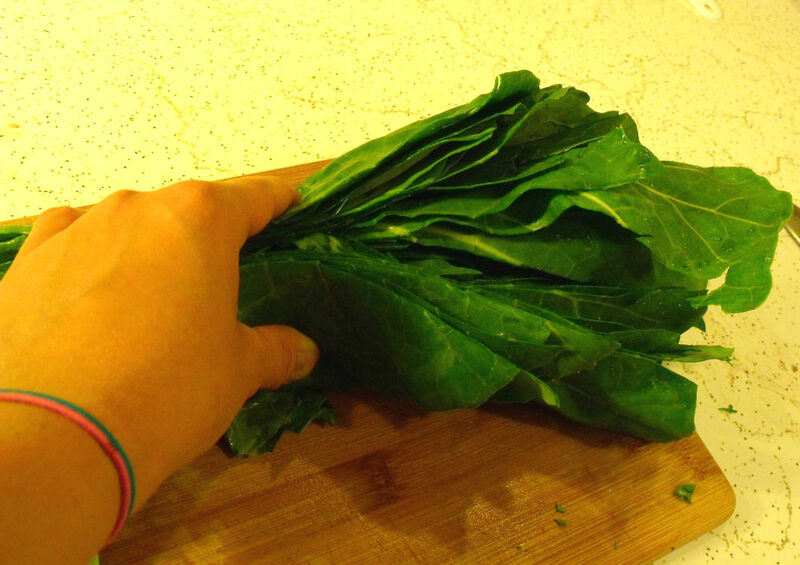 There are few veggies out there that I won’t use in their entirety, but collard and chard stems are one of them. I mean, if I’m making a soup the next day then sure, I’ll toss them in, but really other than that, I don’t force it. I compost now so it’s all good. 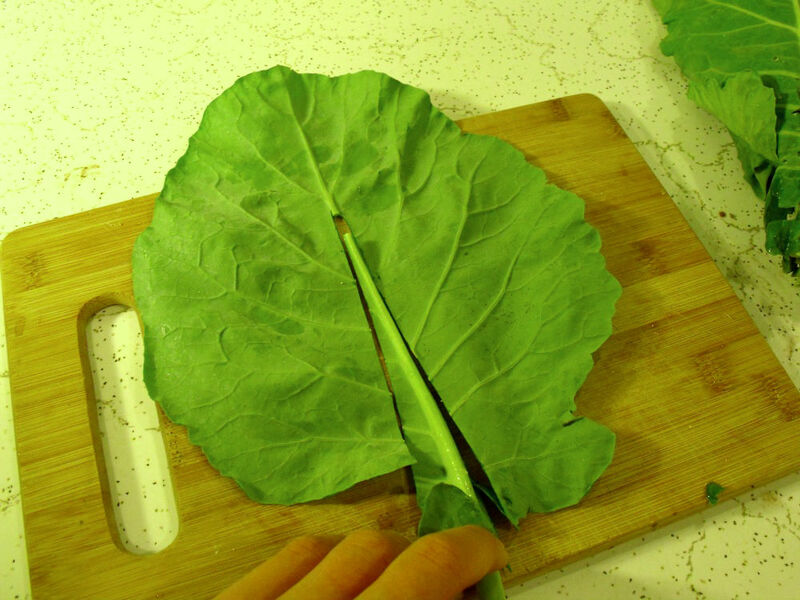 What I like to do here is take each leaf, and quickly slice out the stem, making diagonal cuts right along each side of the rib and plucking the stem from the middle. After doing this to each leaf, I stack them all on top of each other, roll them up like I’m chiffonading basil, make a slice lengthwise down the middle, and then again perpendicularly into strips — this makes perfect little rectangles for sauteeing. 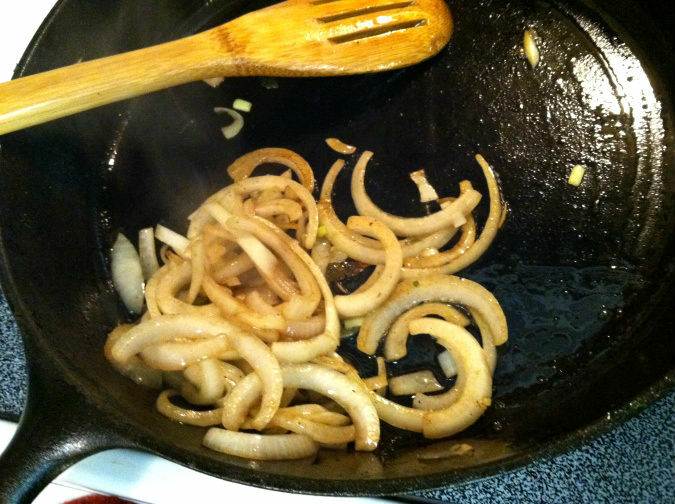 Then, in a separate pan, I heated up some coconut oil, and let the onion caramelize with some salt for a few minutes. 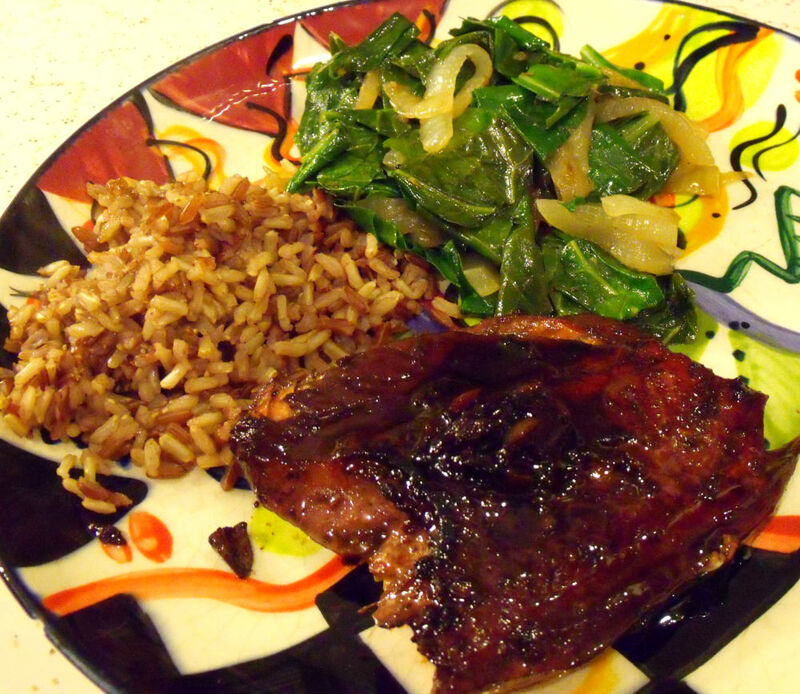 In went all the greens, and as they cooked down to the size of the pan, I added some jerk seasoning, a splash of cider vinegar, and some black pepper. I wanted to add just a bit of chicken broth, but I’ll let you in on a secret. You know those recipes that tell you to add like half a cup of chicken broth? It’s like, who has that? Any commercial liquid broth that’s open in the fridge will go back long before I get a chance to use half a cup of it, and any bullion requires a separate pot to make the broth in…for half a cup? Here’s what I do: I make my own chicken stock each time I roast a chicken — about once a month — and keep the stock in serving-size containers in the freezer, usually cottage cheese-sized. Then I use these the same way you’d use a stick of butter to grease a cooking pan: take out the fist-sized ice cube, and place it in the pan of whatever needs a little extra richness. Not for too long — maybe 3 minutes, until just a few layers (or about half a cup!) melt off. Then, put the broth cube back in the cottage cheese container and replace in the freezer. No harm done, no broth wasted, no extra pot to clean. Did I mention that I don’t have a sink in my kitchen? Yep, 4 years and approximately 3,800 meals cooked…without a kitchen sink. Just one of the many things I’m really, really excited about in my new house. 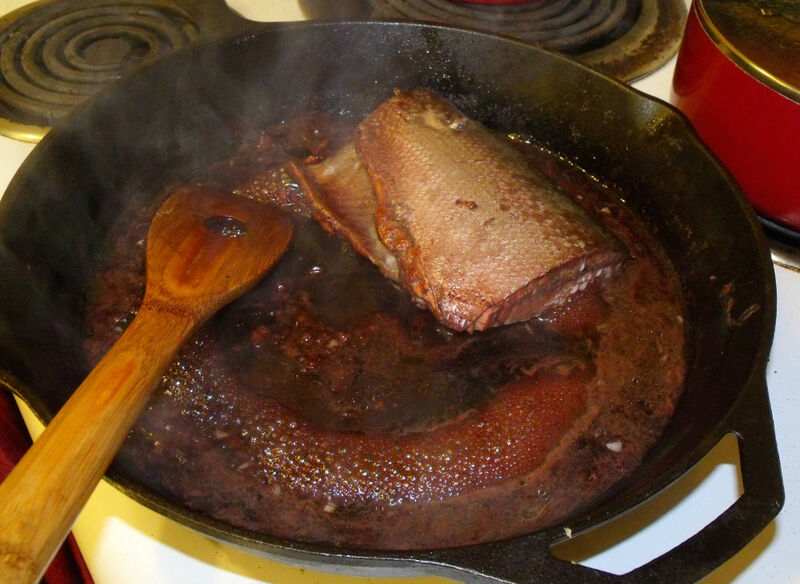 So anyway, I took the greens off the heat and let them absorb the rest of that broth while they cooled, and returned the salmon-and-sauce pan back to medium-high heat for another five minutes or so until the salmon had finished cooking and was wonderfully warm and caramelized. Roasted plantain chips: $1.69 — for the bike ride home. If a month-long blogging hiatus is not enough to evidence a busy summer, let me just state for the record…it’s been busy. Between running the new UCU indie craft market at the Northwest Folklife Festival over Memorial Day, impromptu barbecues, a trek up Dog Mountain, a bachelorette party, and a visit from my oldest friend, I have not been left with a lot of time for taking pictures of my food. Admittedly, it’s a lot easier to stick to an $150-a-month food budget when the summer crazy sets in and fall evenings that used to be spent making elaborate soups and casseroles are replaced with burritos from Los Gorditos. I should point out two things here — one is that, since six dollars a day works out to about $180 a month, I do have a little cushion built in for the occasional grab-and-go dinner, as well as a whole separate part of my budget dedicated to eating out, which averages out to approximately $90 a month. So I recognize that the eating-out-to-cooking-at-home ratio rises in the summer and falls in the winter, and that between the supplementary eating-out budget, going over to friends’ houses for dinner, and a creative use of leftovers, it all works out. So, that being said, I had some time last night to whip up a quick little dinner before meeting my friend at Beulahland. I’ve had my eye on the green beans at New Seasons for months now, waiting for them to turn local, and they finally have! and to that added half a red onion and a couple stalks of celery, both chopped, letting them marinade while I worked on the rest. I trimmed the stems off of the green beans and boiled them for just three quick minutes. Then I heated a handful of almonds in a saucepan with olive oil, salt, pepper, and a bit of nutritional yeast on medium high heat until they were warm, then added the green beans for the last minute, just to get them a little toasty, salty, and brown. This mixture went into a big mixing bowl and got the pickled veggies and dressing spooned over top! Meanwhile, I had cooked up some bulghur (boiled a cup of water with some salt and butter, and added half a cup of bulghur once it was boiling, then turning the stove down to simmer until all the water had been absorbed. And finally, for some protein, I pan-fried some Trader Joe’s swordfish that I had in the freezer, along with some basic commercial pesto. I can never go through pesto quickly enough before it starts to get moldy, so I started keeping this in my freezer and just using a spoonful here and there whenever I need, letting whatever food I’m mixing it into heat it up back to its regular oily state, and it works perfectly. I added just enough white wine to deglaze the pan once everything had started to brown, and with some salt and pepper on top, it was perfect. Okay, guys. This meal took 15 minutes to make, from the minute I walked in the door to the moment I sat down at the table — no joke. Granted, it did require the purchase of a fresh piece of fish, which I rarely do, but I had to swing by Fred Meyer after work anyway, because the wind today was so strong that it actually tore the face off my A-board at the store and I needed to buy some heavy duty adhesive before going to work tomorrow. And then apparently a container of olives to eat while I drove home. Anyway, this meal was the result of three super-fast components — a critical feature since I don’t get my days off this week, yet still have to do all my typical prep-before-a-trip stuff, before heading up to my mom’s on Thursday after work. The ratio for cornmeal is about 3:1, so for myself I combined in a pot 1/3 of a cup of cornmeal, 1 cup of water, a hefty pinch of salt and pepper, a couple shakes of red pepper flakes, and a few sundried tomatoes (I buy them in the bulk aisle, not packed in oil). I brought all this to a boil, and then reduced to low until the liquid had absorbed; then I added about 1/3 of a cup of milk, gave it a stir and let that absorb as well, then removed it from the heat and kept it covered. 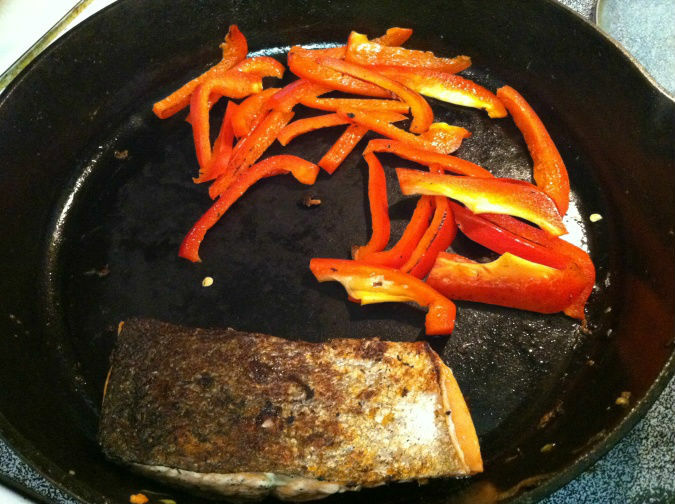 Meanwhile, I pan fried the salmon in a little olive oil and my favorite Caribbean seasoning. Atop this I sprinkled a little more salt, pepper, some nutritional yeast, and then a couple squirts of lime juice, and stirred it for about a minute, until the greens had wilted down to a manageable volume. 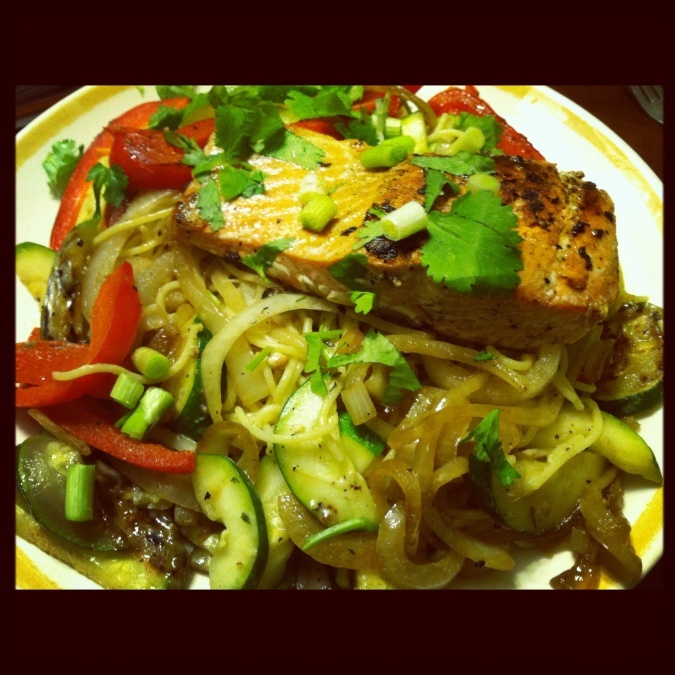 This was an iron chef kind of meal. Nothing in mind to make for dinner, but a green pepper and gargantuan eggplant that needed to be used up. Sometimes I like to chop up eggplant into little chunks and use it in a sauce, or puree it and make babaghanoush, but tonight I was in the mood for something meatier, like thick roasted slices of eggplant, mushy but charred at the same time. I sliced the eggplant, and lined them up on a baking sheet before spreading them with olive oil, and sprinkling them with chopped garlic, salt, and nutritional yeast. I covered them with another layer of foil and baked at 400 degrees for 30 minutes, and then to crispen the tops, broiled for about two minutes with the foil off. Simply sauteeing the pepper would have made this meal too bland — there needed to be some red in there. I found the letovers from a large can of juicy diced tomatoes in the freezer, which was precisely what this meal needed. Prep-wise, all I had to do was chop half a yellow onion and the green pepper into small squares, and saute this in my small soup pot with some olive oil, salt, red pepper flakes, and the fresh herbs that I had on hand — oregano and marjoram (I don’t even chop these, just flake them off the stem straight into the pot). To that I added the frozen brick of tomatoes and a little water, and covered on high-medium heat until it had all melted into a rich, bubbling sauce. Then I added some leftover red wine that I had in the fridge to give it a smokier flavor, and let it bubble for awhile with the lid off, to reduce. Last but not least, the quick and easy protein was a package of Trader Joe’s ahi tuna steaks. Pre-marinated, all you have to do is defrost and sautee, with some lime juice over top to finish.